Is a Higher Meals Tax in Arlington County's Future? An online story in the Arlington Sun Gazette by Scott McCaffrey today says, "Arlington legislative proposal could lead to higher meals tax in county." Arlington currently charges a 4% meals tax, which is levied on top of the 6% sales tax. "They aren’t saying so explicitly, but Arlington County Board members may seek authorization from the General Assembly to increase the county’s meals tax from its current rate of 4 percent. "A request to grant counties the same taxing authority as cities – “to provide a level playing field among localities” – is included in the County Board’s draft 2017 legislative package, which was unveiled Oct. 28 and will be the subject of a public hearing in December. "The proposal is basically boilerplate, being included in the legislative package in one form or another every year. Members of the legislature have shown little inclination to act on it. "But the meals-tax question took on added significance this year, as Fairfax County is going through a contentious political battle over imposition of one. In the midst of the fight, the Virginia Association of Counties, or VACo, (of which the Arlington and Fairfax governments are a part) came out with its draft legislative plan, asking the General Assembly to give counties the power to increase the meals tax from its current statutory maximum of 4 percent to as much as 8 percent. "The VACo draft proposal also asked the legislature to rescind its requirement that counties hold a referendum to approve imposition of a meals tax. (Arlington, which had been exempted from that requirement, never held a referendum.)" The equal taxing authority mentioned above is part of the Arlington County Board's 2017 General Assembly Legislative Package (item #42 on the Board's November 5 agenda). Specifically, the equal taxing authority is item A.2. in the package's Finance section. On Saturday, November 5, 2016, there will be a "public hearing on the Legislative Package for consideration of adoption at the December 10, 2016, County Board meeting." We've growled three times during October about the meals tax, the Board's lobbying arm in Richmond -- the Virginia Association of Counties (VACo) -- and Virginia counties' never-ending search for greater taxing authority -- October 2, October 11, and October 21. "When I was a young tax associate, a tax partner told me that there were about 20 pages in the Internal Revenue Code and about 50 pages of Treasury Regulations that boiled down to one sentence: "If you are in the real estate business, and if you have a good tax lawyer and a good accountant, you don't pay taxes." Source: page 226, "As Certain as Death: Quotations about Taxes," 2010, compiled by Jeffrey Yablon, TaxAnalysts.com. "The irony is that free people usually create far more wealth than the coerced, which makes the lower echelons better off, a fact that reminds “equality” is usually about empowering progressive elites rather than materially helping the poor. Moreover, in a free society, there are all sorts of forces — religion, constantly improving and ever cheaper technology, family pressures, honor, shame, philanthropy — that redistribute wealth either naturally or through the consent of the giver, and far more effectively than creating a huge government equalocracy that seeks power to bully others and exempt itself." Source: his January 14, 2014 column, "The Idol of Equality," posted at National Review Online. Earlier this week, "Citizens Against Government Waste (CAGW) named Rep. Charlie Dent (R-Pa.) its October Porker of the Month for his efforts to allow the wasteful Export-Import (Ex-Im) Bank to function with limited accountability," according to this press release. "The Ex-Im Bank is an independent government agency that was founded in 1934 to help encourage U.S. exports. The bank provides taxpayer-backed direct loans, guarantees, and export credit insurance, which totaled $12.4 billion in fiscal year (FY) 2015. "Rep. Dent called Ex-Im, “an important job creation tool of the United States” in a lengthy defense of the bank in an August 12, 2016, Lebanon Daily News op-ed. But, Rep. Dent is failing to tell his constituents the inconvenient fact that 64 percent of Ex-Im Bank financing is directed to just 10 giant, highly profitable corporations, including a whopping 40 percent to Boeing. Stable, profitable companies have all received taxpayer support from the Ex-Im Bank despite having had no trouble securing private financing. "After taxpayer groups, including the Council for Citizens Against Government Waste, convinced Congress to allow the bank’s charter to expire on June 31, 2015, Rep. Dent was a key leader in the effort to resurrect the bank. He voted to reauthorize it at the end of 2015 and took credit for ensuring the Bank’s survival. Now, Rep. Dent is fighting to allow the bank to operate with just two board members instead of three, which means one-third less accountability for the taxpayer-backed corporate welfare it provides. Rep. Dent, along with Sen. Lindsey Graham (R-S.C.), attempted to circumvent regular order by attaching this authority to the short-term continuing resolution (CR) on September 28, 2016. While that effort failed, they had already succeeded in attaching the same provision to the fiscal year 2017 Foreign Operations appropriations bill that will likely be included in the omnibus spending bill that is expected to pass before the current CR expires on December 9, 2016. Rep. Charlie Dent is serving his sixth term, and a member of the powerful Committee on Appropriations. See CAGW's press release for the embeded links that will take you to the supporting documents, e.g., Veronique de Rugy's article for the GMU's Mercatus Center. Kudos to Citizens Against Government Waste (CAGW) for their continuing work on behalf of America's taxpayers. The Washington Free Beacon's Ali Meyer reported yesterday that an audit by the U.S. Department of Agriculture's Inspector General showed, "States Did Not Enforce Work Requirements for Food Stamp Recipients." "States did not always enforce work requirements for food stamp recipients before giving them benefits because doing so was “too burdensome” for them, according to an audit from the Department of Agriculture’s Inspector General. "The Food and Nutrition Service established work requirements for Supplemental Nutritional Assistance Program participants who are able-bodied adults without dependents, fall in the age range of 18 to 49, and are not disabled. These individuals are required to work 20 hours or more each week or participate in a qualifying work activity. "If an individual does not meet this work requirement, he can only receive benefits for three months in a span of three years. "The agency can approve states to waive this time limit if a state’s unemployment rate is above 10 percent or in an area with insufficient jobs. Despite this, auditors found that the agency has approved waiver requests for areas where there is effectively full employment. "The audit found that officials in three states specifically requested these time limit waivers because tracking the work requirements was too burdensome. “Able-bodied adults without dependents may or may not be required to work depending on which state they live in,” the audit said. "For example, one state was not applying the time limit to able-bodied adults without children who were already receiving benefits. This resulted in some of these individuals earning up to a year of benefits instead of the three months allowed by law. "The agency said it is ramping up oversight of this problem." Guess the Left's war on soldiers is ok, but preventing the redistribution of wealth to able-bodied welfare recipients overburdens some government workers. Unbelievable! "A few weeks ago, my column discussed the dishonesty of college officials (http://tinyurl.com/zgmhzkc). Here's more evidence: Among high-school students who graduated in 2014 and took the ACT college readiness exam, here's how various racial/ethnic groups fared when it came to meeting the ACT's college readiness benchmarks in at least three of the four subjects: Asians, 57 percent; whites, 49 percent; Hispanics, 23 percent; and blacks, 11 percent. However, the college rates of enrollment of these groups were: Asians, 80 percent; whites, 69 percent; Hispanics, 60 percent; and blacks, 57 percent. What I am labeling as dishonest, fraudulent or deceitful comes from the fact that many more students are admitted to college than are in fact college-ready. Admitting such students may satisfy the wants and financial interests of the higher education establishment, but whether it serves the interests of students, families, taxpayers and the nation is another question. "To accommodate less college-ready students, colleges must water down their curricula, lower standards and abandon traditional tools and topics. Emory University English professor Mark Bauerlein writes in his book "The Dumbest Generation": Tradition "serves a crucial moral and intellectual function. ... People who read Thucydides and Caesar on war, and Seneca and Ovid on love, are less inclined to construe passing fads as durable outlooks, to fall into the maelstrom of celebrity culture, to presume that the circumstances of their own life are worth a Web page." Source: his 10/26/16, "Dumb American Yourth," posted at Townhall.com. The National Taxpayers Union (NTU) released their annual study of the voting records of members of Congress for First Session (2015) of the 114th Congress. The study is unique in that it counts "actual vote -- every vote that affects taxes, spending, and debt," according to NTU's press release, yesterday. "The Taxpayer Score measures every member’s support level to cut spending, reducing regulations, and opposition to increasing taxes. "Every roll call vote in the First Session of the 114th Congress was analyzed for this year’s Rates Congress, and those that affected the amounts of federal taxes, spending, debt, or regulations were included in the grade evaluations. There were 141 votes in the Senate and 267 in the House that involved appropriations, tax bills, amendments, and certain procedural votes that affect the financial burden on taxpayers. "The number of votes included in this year’s analysis reflects an objective and nonpartisan weighting of the votes, calculated, and numerous error checks ensure the highest possible level of accuracy in the data. While we believe this method is the most accurate, no study or analysis can fully evaluate every Member’s overall record." For a more detailed explanation of the Taxpayer Score, and the computation methodology, visit Rates Congress. By comparison, Rep. Dave Brat, who defeated House Majority Leader Eric Cantor in the June 2014 Republican primary for Virginia's 7th Congressional District is a Taxpayer Friend because of his 'A' Taxpayer Score. Other Virginia Representatives who received 'good' scores included Bob Goodlatte (B+), Randy Forbes (B+), Robert Hurt (B+), Morgan Griffith (B), Robert Wittman (B), and Barbara Comstock (B-). Other Virginia representatives and their scores were Edward Rigell (C+), Gerald Connelly (F), and Robert Scott (F). To see charts of how the average Taxpayer Scores have trended from 2010 to 2015 for both the Senate and the House of Representatives, click here. To view the results for all members of Congress for the 1st session of the 114th Congress, click here. For the 2015 list of Taxpayer Friends in the House and Senate, click here. For a list of votes used to establish the NTU Ratings, please click here. And finally, to see the results of previous years of Rates Congress, click here. CNS News posted an Associated Press story this evening, written by the AP's Ricardo Alonso--Zaldivar, with a heading that says, "Obama administration confirms double-digit premium hikes." "Premiums will go up sharply next year under President Barack Obama's health care law, and many consumers will be down to just one insurer, the administration confirmed Monday. That's sure to stoke another "Obamacare" controversy days before a presidential election. "Before taxpayer-provided subsidies, premiums for a midlevel benchmark plan will increase an average of 25 percent across the 39 states served by the federally run online market, according to a report from the Department of Health and Human Services. Some states will see much bigger jumps, others less. "Moreover, about 1 in 5 consumers will only have plans from a single insurer to pick from, after major national carriers such as UnitedHealth Group, Humana and Aetna scaled back their roles. ""Consumers will be faced this year with not only big premium increases but also with a declining number of insurers participating, and that will lead to a tumultuous open enrollment period," said Larry Levitt, who tracks the health care law for the nonpartisan Kaiser Family Foundation." "HHS essentially confirmed state-by-state reports that have been coming in for months. Window shopping for plans and premiums is already available through HealthCare.gov. "Administration officials are stressing that subsidies provided under the law, which are designed to rise alongside premiums, will insulate most customers from sticker shock. They add that consumers who are willing to switch to cheaper plans will still be able to find bargains. "The vast majority of the more than 10 million customers who purchase through HealthCare.gov and its state-run counterparts do receive generous financial assistance. "Enrollment is concentrated among very low-income individuals who receive significant government subsidies to reduce premiums and cost-sharing," said Caroline Pearson of the consulting firm Avalere Health." Here's a link to the story at the Associated Press website. "Obamacare shoppers in most states will see premiums rise by 22 percent and have 36 percent fewer plans to choose from next year, according to insurance plan data released Monday by the Obama administration. "The buffet of 2017 plan options is decidedly smaller and pricier than in years past, prompting officials to stress the availability of federal subsidies for most consumers and the importance of shopping around for more affordable coverage. "When the Affordable Care Act's fourth enrollment season begins Nov. 1, consumers in the 38 states using the federal healthcare.gov marketplace will see median prices for the cheapest plans in the middle silver tier rise 16 percent. Average rates in those plans will rise by 25 percent and by 22 percent when factoring in three state-run marketplaces for which data were available." "President Obama once told the country that ObamaCare was a "great product." When open enrollment for ObamaCare begins on Nov. 1, millions of Americans will discover just how big a lie this was. "Although the mainstream press has largely ignored it during this election in favor of wall-to-wall coverage of Donald Trump's alleged misdeeds, ObamaCare is absolutely coming unglued. "When the exchanges open for business in two weeks, people looking for insurance there will find far fewer choices, sky-high premiums and lower-quality plans. "A recent analysis by Bloomberg found that because insurance companies have bailed out of so many ObamaCare markets, more than 1.4 million people will be forced to switch plans during open enrollment. In most cases, that will mean finding new doctors and other providers as well. "Millions will find only one insurance company participating in their area. Oklahoma, Alaska, Wyoming, Alabama and South Carolina will have one ObamaCare insurer statewide, and so will most counties in Florida, Mississippi, North Carolina. Before ObamaCare, 17 insurers competed for business in Kansas. When the exchanges open up in November, most will have a choice of two. "A Kaiser Family Foundation review found that, overall, nearly a third of the counties in the U.S. will have only one insurer. "Premiums for the vast majority of these plans will climb at rates that were unimaginable before ObamaCare "fixed" the individual insurance market." "The subsidies will shield many Obamacare purchasers from the impact of the increase, but a large of number of purchasers will be hammered. And, of course, taxpayers will be hit as well by virtue of the increased subsidy payments. "Most significantly, the skyrocketing premiums non-subsidized Obamacare customers face will fuel the cycle that’s causing premiums to skyrocket. Premiums risen dramatically because too few healthy people who aren’t entitled to subsidies are enrolling in Obamacare. Thus, those who have’t yet eschewed it are required to pay more. "But the more they are asked to pay, the more likely they are to eschew Obamacare in the future. This will mean that premiums must be significantly hiked again the next time, and the cycle — or “death spiral” — will continue." "When confronted in the final presidential debate with the assertion that each of their plans would increase the national debt, the candidates denied it by saying either economic growth or higher taxes would offset this increase. "But deficit spending and unsustainable debt pose a significant threat to our economy. The House Budget Committee recognizes this threat, recently releasing a working paper highlighting the damaging economic effects of the national debt. The results are scary. "As the government runs increasing budget deficits, it must borrow more money to fund current commitments, such as entitlements, and make interest payments on the debt. This makes interest rates a larger share of the federal budget and in turn increases borrowing by the government. "Academic research shows that high national debt is associated with less economic output and less prosperity for individuals and families. "Congress and the new president must begin to take our deficit spending and growing debt seriously. "Lawmakers should not raise taxes to try to solve the government’s fiscal problems. Our debt and deficits are the result of a spending problem, not a revenue problem. "This is exactly the scenario we’re witnessing, given current projections. "Raising taxes would weaken the economy further and worsen the fiscal trajectory. The United States already has the highest corporate tax rate in the industrialized world; raising taxes higher would discourage investment and job creation." "The fact that the national debt jumped by $1.4 trillion in one short year should spur Congress to put an end to this excess. "The debt hit a record-breaking high of $19.6 trillion at the close of the federal government’s 2016 fiscal year on Sept. 30. It had totaled $18.1 trillion at the end of the previous fiscal year." Both commentaries contain several embedded links that contain additional information. Two of them are especially informative. They are the Heritage Foundation’s “Blueprint for Balance” and “Blueprint for Reform,” which "lay out a detailed plan to reform entitlements and control spending to balance the budget and reduce the debt." "Harvard economist Martin Feldstein, using the 1986 tax reform, estimated that when marginal tax rates on the top income bracket dropped from 50 percent to 28 percent, reported taxable income increased by 44 percent. This didn't fully make up for the reduction in revenues caused by the reduction in the tax rates, but it did pay for half of it and exposed the inefficiency of high taxation." Source: page 219, "A Capitalism for the People: Recapturing the Lost Genius of American Prosperity. Luigi Zingales is the Robert C. McCormack Distinguished Service Professor of Entrepreneurship and Finance, and Charles M. Harper Faculty Fellow at the University of Chicago Booth School of Business. His " research interests span from corporate governance to financial development, from political economy to the economic effects of culture. He co-developed the Financial Trust Index, which is designed to monitor the level of trust that Americans have toward their financial system. In addition to holding his position at Chicago Booth, Zingales is currently a faculty research fellow for the National Bureau of Economic Research, a research fellow for the Center for Economic Policy Research, and a fellow of the European Governance Institute. He is also an editorialist for Il Sole 24 Ore, the Italian equivalent of the Financial Times. Zingales also serves on the Committee on Capital Markets Regulation, which has been examining the legislative, regulatory, and legal issues affecting how public companies function. In 2014 he was the President of the American Finance Association," according to the faculty directory. The Arlington Sun Gazette included two short editorials in its Highs & Lows on its opinion page this week. The second editorial -- called a Thumbs Down in this case -- concerns a proposal by the Virginia Association of Counties (VACo) to ask the Virginia General Assembly to allow counties to double the meals tax rate and to remove the requirement that voters first approve a meals tax before it's imposed. "To a little-noticed but outrageous proposal by the Virginia Association of Counties, of which the Arlington County government is a dues-paying member. "As part of its 2017 legislative package, currently in the draft stage, the organization plans to ask the General Assembly to allow counties (a) to double the maximum meals-tax rate that can be imposed, from 4 percent to 8 percent, and (b) eliminate the requirement that counties get voter approval before imposing such a tax. "Counties and their state organization no doubt will contend they’re just trying to get the same powers that cities have when it comes to taxation. But it looks to us to be another attempt to pick taxpayers’ pockets without the consent of the governed. "Rest assured: The proposal is going nowhere in Richmond. But the fact it was even brought up shows how out of touch some leaders and staff can be. The public isn’t your never-ending ATM, folks." We growled about the VACo legislative proposal on October 11, 2016. "In a briefing described by one County Board member as sobering, Arlington officials said they believe the best-case economic-development scenario for the county is to “slowly and steadily” reduce record office-vacancy rates. "But even that relatively modest hope could face headwinds, with new employment patterns, increased competition from other jurisdictions and the federal government angling for cheaper leases all conspiring against what had once been Arlington’s main selling point: its central location. "Arlington’s combination of high vacancy rates and high average rents is “not a good place” to be in, said Arlington Economic Development chief Victor Hoskins during an Oct. 18 briefing with elected officials." "Countywide, office-vacancy rates stood at just over 20 percent in mid-2016, with county economic-development officials guesstimating the rate ultimately will decline to under 15 percent. But that might not happen until 2023, and perhaps not at all if the General Services Administration continues to pull out of Arlington." He also reported the "commercial office space has seen average rents decline over the past five years in Arlington, from $45.43 per square foot in 2011 to $42.95 in 2016," and then added, 'County Board member Christian Dorsey called the discussion 'sobering . . . but illuminating.'" McCaffrey's entire article is well-worth reading. We growled on April 29, 2016 about jobs and economic development, noting the average office vacancy rate in February 2015 was 21.7%. It dropped to 20.1% in February 2016. We also growled on October 5, 2015, about the county's high occupancy rate, pointing out that 3 of 4 County Board candidates' top concern was Arlington's high office occupancy rate. Finally, on March 13, 2015, we growled about a March 3 presentation by the chair of the Arlington County Board's Economic Development Commission, Sally Duran, discuss "the importance of a flourishing business community which will substantially benefit Arlington taxpayers." An important take away from her presentation was that a 10% increase in office occupancy should result in a $34 million increase in real estate taxes. At the time, the office vacancy rate was 21.8%. In a County Board budget work session a week later, the newly-appointed director of economic development proposed an additional "investment" of taxpayer dollars of $3.95 million for each of the next three years to "(r)educe office vacancy by half and diversify the Arlington economy over the next 36 months." Now they say the office-vacancy rate may decline to 15% by 2023, or even achieve no growth at all. It will be interesting to see just how accountable the Board holds the director of economic development. "The federal USF (FUSF) is administered by the Federal Communications Commission (FCC) under open-ended authority from Congress. The program subsidizes telecommunications services for schools, libraries, hospitals, low-income people, and rural telephone companies operating in high cost areas," according to the Tax Foundation study. Last Tuesday, October 11, the Tax Foundation released a new, state-by-state analysis of cell phone taxes, "done jointly with Scott Mackey of KSE Partners" that found "the average U.S. customer pays more than 18 percent in taxes and fees on their wireless bill, several times the state sales tax rates," writes Joseph Henchman at the Tax Foundation's Tax Policy Blog. Each year, consumers pay an estimated $17.2 billion in wireless taxes, fees, and government surcharges combined. In just two years, the average wireless tax burden has increased by 1.5 percentage points, and wireless taxes are now 4.5 percentage points higher than they were ten years ago. The average state-local wireless tax in the U.S. is 11.93%, more than 4 percentage points higher than the average state-local sales tax. The five states with the highest combined state and local wireless taxes and fees are Washington (18.8%), Nebraska (18.7%), New York (18.0%), Illinois (17.8%), and Pennsylvania (15.7%). The five states with the lowest combined state and local wireless taxes and fees are Oregon (1.8%), Nevada (2.1%), Idaho (2.3%), Montana (6.2%), and Delaware (6.3%). Six major U.S. cities now have wireless tax rates exceeding 25 percent: Chicago (36.24%), Baltimore (29.84%), New York (27.11%), Philadelphia (26.24%), Omaha (26.06%), and Seattle (25.94%). According to the study, "Wireless consumers pay an estimated $17.2 billion in taxes, fees, and government surcharges." This includes: "$7.0 billion in sales taxes and other non-discriminatory broad-based consumption taxes; $5.1 billion in federal Universal Service Fund (FUSF) surcharges; $2.5 billion in 911 fees; and, $2.6 billion in other discriminatory state and local taxes, fees, and surcharges." It's important to note, however, "In recent years, increases in the federal USF charge were the largest drivers of rising wireless taxes and fees. This year, however, state and local taxes and fees increased significantly faster that the federal USF surcharge." You can access both the executive summary and entire 19-page report here. It's worth taking a look since there are several helpful tables and charts. In this study, Virginia scores well, ranking #47 with a combined state-local rate of 6.68%. Coming in #1 was the state of Washington with a state-local rate of 18.78% followed by Nebraska with a combined rate of 18.67% and New York was #3 with a combined rate of 18.04%. The federal government adds on an additional 6.64%. So kudos on this study to the Virginia General Assembly! "You mustn't judge a politician by talk. You have to judge them by performance." "Milton Friedman was the twentieth century’s most prominent advocate of free markets. Born in 1912 to Jewish immigrants in New York City, he attended Rutgers University, where he earned his B.A. at the age of twenty. He went on to earn his M.A. from the University of Chicago in 1933 and his Ph.D. from Columbia University in 1946. In 1951 Friedman received the John Bates Clark Medal honoring economists under age forty for outstanding achievement. In 1976 he was awarded the Nobel Prize in economics for “his achievements in the field of consumption analysis, monetary history and theory, and for his demonstration of the complexity of stabilization policy.” Before that time he had served as an adviser to President Richard Nixon and was president of the American Economic Association in 1967. After retiring from the University of Chicago in 1977, Friedman became a senior research fellow at the Hoover Institution at Stanford University. "Friedman established himself in 1945 with Income from Independent Professional Practice, coauthored with Simon Kuznets. In it he argued that state licensing procedures limited entry into the medical profession, thereby allowing doctors to charge higher fees than they would be able to do if competition were more open. "His landmark 1957 work, A Theory of the Consumption Function, took on the Keynesian view that individuals and households adjust their expenditures on consumption to reflect their current income. Friedman showed that, instead, people’s annual consumption is a function of their “permanent income,” a term he introduced as a measure of the average income people expect over a few years." "What our generation has forgotten is that the system of private property is the most important guarantee of freedom, not only for those who own property, but scarcely less for those who do not. It is only because the control of the means of production is divided among many people acting independently that nobody has complete power over us, that we as individuals can decide what to do with ourselves." "If any twentieth-century economist was a Renaissance man, it was Friedrich Hayek. He made fundamental contributions in political theory, psychology, and economics. In a field in which the relevance of ideas often is eclipsed by expansions on an initial theory, many of his contributions are so remarkable that people still read them more than fifty years after they were written. Many graduate economics students today, for example, study his articles from the 1930s and 1940s on economics and knowledge, deriving insights that some of their elders in the economics profession still do not totally understand. It would not be surprising if a substantial minority of economists still read and learn from his articles in the year 2050. In his book Commanding Heights, Daniel Yergin called Hayek the “preeminent” economist of the last half of the twentieth century. "Hayek was the best-known advocate of what is now called Austrian economics. He was, in fact, the only major recent member of the Austrian school who was actually born and raised in Austria. After World War I, Hayek earned his doctorates in law and political science at the University of Vienna. Afterward he, together with other young economists Gottfried Haberler, Fritz Machlup, and Oskar Morgenstern, joined Ludwig von Mises’s private seminar—the Austrian equivalent of John Maynard Keynes’s “Cambridge Circus.” In 1927 Hayek became the director of the newly formed Austrian Institute for Business Cycle Research. In the early 1930s, at the invitation of Lionel Robbins, he moved to the faculty of the London School of Economics, where he stayed for eighteen years. He became a British citizen in 1938. "Most of Hayek’s work from the 1920s through the 1930s was in the Austrian theory of business cycles, capital theory, and monetary theory. Hayek saw a connection among all three. The major problem for any economy, he argued, is how people’s actions are coordinated. He noticed, as Adam Smith had, that the price system—free markets—did a remarkable job of coordinating people’s actions, even though that coordination was not part of anyone’s intent. The market, said Hayek, was a spontaneous order. By spontaneous Hayek meant unplanned—the market was not designed by anyone but evolved slowly as the result of human actions. But the market does not work perfectly. What causes the market, asked Hayek, to fail to coordinate people’s plans, so that at times large numbers of people are unemployed?" At his website, Senator Bernie Sanders claims, "Millions of Americans are working for totally inadequate wages. We must ensure that no full-time worker lives in poverty. The current federal minimum wage is starvation pay and must become a living wage. 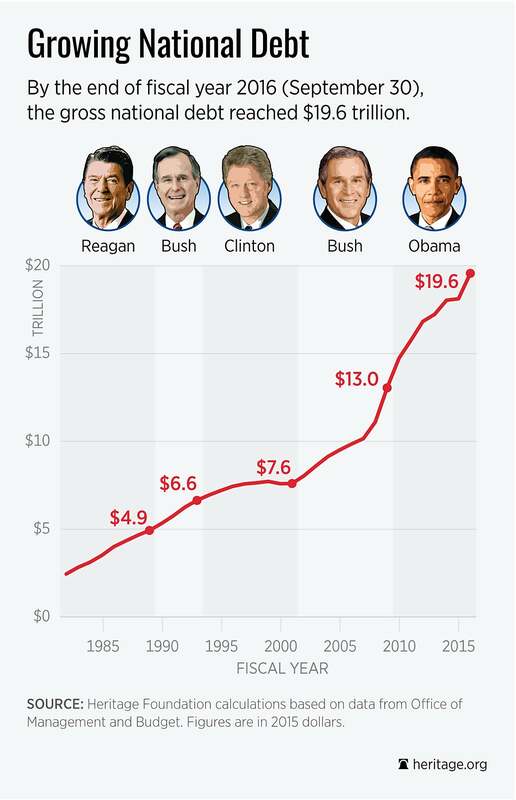 We must increase it to $15 an hour over the next several years." Preston Cooper, fellow at the Manhattan Institute, dug into the Census Bureau's 2015 report on Income and Poverty in the United States, and shows that few full-time workers live in poverty, according to the report he posted last week at Economics 21, the economics research center of the Manhattan Institute. Here's a portion of his explanation"
“Nobody who works 40 hours a week should live in poverty.” This sentiment has been expressed by Democrats from Vice President Joe Biden to Senator Bernie Sanders, and is used to support raising the minimum wage from the current federal level of $7.25 per hour to $12 or even $15 per hour. But the “40 hours a week” mantra misdiagnoses poverty in America. The largest cause of poverty is not low wages but lack of work altogether. "According to the Census Bureau’s recently released report, Income and Poverty in the United States: 2015, just 2.4 percent of working-age individuals employed full-time and year-round live in poverty, down from 3 percent in 2014. By contrast, nearly a third (31.8 percent) of non-workers were below the official poverty threshold. "Of the roughly 24 million working-age individuals below the poverty line in 2015, just 2.5 million had a full-time, year-round job. Even this number is likely overstated—the definition of poverty used by the Census Bureau does not take into account taxes and transfers such as the Earned Income Tax Credit, which tops up the wages of low-income workers. "By contrast, nearly 15 million non-workers—representing 63 percent of working-age people in poverty—were below the poverty line in 2016. Not only are there more non-workers in poverty, but these individuals are also climbing out of poverty at a slower rate. While the number of full-time, year-round workers in poverty fell by 18 percent in 2015, the number of non-workers in poverty fell by just 9 percent. "Politicians who want to raise the minimum wage argue that it will reduce poverty. But the minimum wage comes with a tradeoff—higher wages for some, but fewer jobs for others as employers cut back on hiring due to heftier labor costs. "If the goal is poverty alleviation, the tradeoff inherent in raising the minimum wage is not worth it. 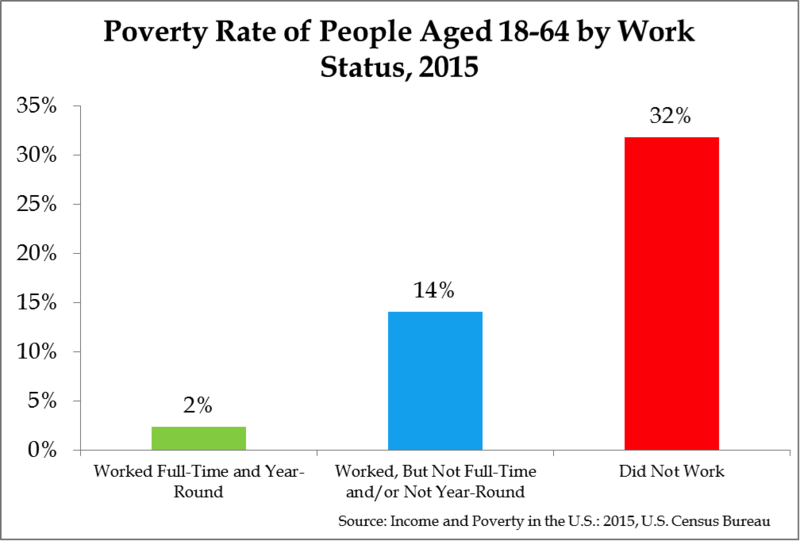 Antipoverty policy should focus on helping the nine-tenths of working age people in poverty who do not work 40 hours a week and year round. Raising the minimum wage would aid just a small share of those in poverty—while creating even higher barriers to entering the workforce for everyone else." His conclusion is on-point when he says, "To create effective solutions to poverty, we must be honest about its causes. Some people in poverty work 40 hours a week, but focusing exclusively on these individuals misses 90 percent of the problem." Cooper's entire paper is worth reading, especially since it's fairly short. He includes a second chart showing the percentage of people aged 18-64 in poverty by work status in 2015. Specifically, 63% did not work, 26% worked, but not full-time and/or not year-round. Only 11% worked full-time and year-round. "The three remaining candidates for the Democrat Party had a long discussion about the minimum wage and what it should be raised to during their last debate. Former Maryland governor Martin O’Malley and Vermont senator Bernie Sanders supported raising the minimum wage nationwide to $15 per hour. Former Secretary of State Hillary Clinton played the role of the (relative) grown-up in the room by supporting a raise in the federal minimum wage to “only” $12 per hour. What all three Democrats showed is that they either don’t understand economics or simply cannot speak the truth to the people they need as supporters and voters. "Sanders made clear the more liberal stance on the minimum wage: “You have no disposable income when you make 10, 12 bucks an hour. When we put money into the hands of working people, they’re going to go out and buy goods, they’re going to buy services and they’re going to create jobs in doing that.” This is the first mistake that liberals make—believing that money in the hands of poor people is better for the economy than the same money in the hands of rich people." Here are two fact checks from PoliticalFact. The first, dated May 9, 2016, has not Truth-o-Meter, but appears skeptical of raising the minimum to $15 per hour. The second, dated May 4, 2016, addresses Sanders' claim that a $15 minimum wage would reduce federal assistance by $7.6 billion. The PolitiFact's Truth-o-Meter gave Sanders a "Mostly False." Dan Taylor, staff reporter for the Arlingotn Patch news site, reported yesterday on a new ranking of every state's most Democratic county. The article is subtitled, "The city (sic) has helped to turn Virginia blue since 2008." "Hillary Clinton is starting to run away with Virginia, a vital swing state with 13 electoral votes at stake, and she can thank Arlington for that, at least partially -- a recent report from 24/7 Wall Street ranks the county the most Democratic in all of Virginia. "According to poll aggregator website FiveThirtyEight, Clinton holds a 7.1 point lead over Donald Trump in the state, a pretty safe lead with just a few weeks to go until Election Day on Nov. 8. And if it weren't for counties like Arlington, she might not get those vital votes in this hotly contested election. "Obama pulled in 69.2 percent of the vote in Arlington County in the last election, the second highest share of any county in Virginia. And Arlington has been sending Democrats to the U.S. House of Representatives since Rep. Jim Moran was elected all the way back in 1990. Moran has since retired and Democrat Don Beyer has taken his place in that seat. "Virginia has not traditionally gone Democratic in presidential elections in the past. While the state voted for Barack Obama in both of the last two elections, it also voted for George W. Bush in both 2000 and 2004 -- and by a wide margin both times. It was also one of the few states to vote for Bob Dole over Bill Clinton in 1996 in what would end up being a landslide Electoral College victory for Clinton. In fact, until Obama came along, Virginia hadn't voted for a Democrat to occupy the White House since Lyndon B. Johnson in 1964 -- one of the most historic landslides ever that saw only six states vote for Barry Goldwater." "Based on voting data compiled by political news organization Politico and a review of current and historical representation in the U.S. Congress, 24/7 Wall St. created an index to measure the political leanings of county residents. The index is based on the political party of the county’s elected representatives to the Senate and House of Representatives through the last five election cycles, as well as the results of the 2012 presidential election. Prince George’s County in Maryland is not just the bluest county in the state, but also in the nation. "Even in the most conservative states, there is at least one county that has strong Democratic leanings. In Alabama, 61% of total voters opted for Republican candidate Mitt Romney in the 2012 elections, one of the highest shares the losing the candidate received of any state. Yet, in Greene County, nearly 85% of voters cast ballots for Obama. While the state has had Republican representation in the Senate for years, Greene County’s congresswoman, Terri Sewell of Alabama’s 7th district, is a Democrat. Sewell’s predecessor, Artur Davis, is also a Democrat. "While both those counties lean heavily Democratic and the reddest states each tend to have low incomes, adults in the blue counties tend to have higher educational attainment rates compared to the reddest counties. In 33 states, adults in the most Democratic county had a higher bachelor’s attainment rate than those in the most conservative-leaning state. "Race clearly bears a strong relationship to political affiliation in these counties. In only three of the reddest counties, a lower share of residents identify as white than the national share of 63% of Americans who identify as white. On the other hand, 28 of the bluest counties have smaller shares of white populations compared to the national average composition." Non-Democrats may be asking themselves if there's a cost to being ranked as the most Democratic county in Virginia. And there likely is although it's unlikely one can arrive at a precise cost per Arlington County household. Some numbers are easy to come by. For example, the 4% meals tax, which taxpayers were saddled with in the early 1990's because Arlington County was burdened with a County Board entirely made up of Democrats. We growled about that earlier this week. We also know the Arlington Public Schools are anywhere from somewhat more expensive to significantly more expensive than other school districts in the Washington, DC area according to the most recent annual report from the Washington Area Boards of Education (WABE), as we growled November 3, 2015. But, unfortunately, the higher cost doesn't seem to result in higher SAT scores. There is also the extravagant stuff for the poor and subsidies for the rich. And then there's our at-large undemocratic Arlington County Board. The Washington Free Beacon's Ali Meyer cites a survey of economists by the Wall Street Journal. She writes, "Economists surveyed by the Wall Street Journal predict there is a 60 percent chance of a recession happening in the next four years, the Journal reported." Her article carries the sub-titled, "Some experts say a mistake by the Federal Reserve could knock the economy off course." "Economists predict that in the next four years either the next president will face a recession or the economy will have the longest expansion in history. "Economists predict that in the next year there is a 20 percent chance of a recession happening. Most citied the biggest risk to the economy a possible global slowdown." "The economic policies of the next president, however, are extraordinarily uncertain. By an 85% to 15% margin, respondents rate the current election as more uncertain than typical, in part due to the growing gap between voters in the two parties. "Hillary Clinton’s economic policies generally resemble those of previous Democratic candidates. But Mrs. Clinton would likely to face a divided and discordant Congress that has been largely unable or unwilling to move legislation in recent years. "Donald Trump has jettisoned the Republican Party’s traditional approach to economics. In a reflection of the size of this departure from the past, not one member of the Council of Economic Advisers for President Ronald Reagan, or either President Bush, has endorsed his campaign. "Mr. Trump has pledged to reverse immigration, renegotiate trade deals, and apply tariffs. On these issues, he differs from the long-held views of many congressional Republicans, including Speaker of the House Paul Ryan. And observers are also left more uncertain than usual as the public discussion has rarely revolved around fleshing out policies . . . ."
"As the old saying goes, 'money is power' and the more money the government takes, the more power it has over individuals." McGlowan's quote is one of "20 of the Best Quotes from Women on the Right," collected by John Hawkins for Townhall.com. She covers political, special interest groups, and lobbies for the Fox News Channel. Source: Walter E. Williams' Collection of Quotations of the Founder's Wisdom. England-born political philosopher and writer Thomas Paine (1737-1809) helped shape many of the ideas that marked the Age of Revolution. Published in 1776, his highly popular “Common Sense” was the first pamphlet to advocate American independence. After writing the “Crisis” papers during the American Revolution, Paine returned to Europe and offered his defense of the French Revolution with “The Rights of Man.” His political views led to a stint in prison; after his release, he produced his last great pamphlets, “The Age of Reason,” an exposition of institutionalized religion, and “Agrarian Justice,” a call for land reform. (emphasis added) Source: History.com. "A new study on the Affordable Care Act, or Obamacare, produced by the Mercatus Center at George Mason University shows that the health care law penalizes Americans who work full-time, will reduce the number of full-time workers, and rewards those who work less." "Starting this year, the United States’ working population will face three major employment disincentives resulting from the very benefits the Affordable Care Act (ACA) provides: (1) an explicit tax on full-time work, (2) an implicit tax on full-time work for those who are ineligible for the ACA’s health insurance subsidies, and (3) an implicit tax that links the amount of available subsidies to workers’ incomes. "A new study published by the Mercatus Center at George Mason University advances the understanding of how much these ACA taxes will reduce overall employment, and why. It concludes that the reduction will be nearly double that projected by previous analyses. Labor markets ultimately will reduce weekly employment per person by about 3 percent—translating to roughly 4 million fewer full-time-equivalent workers." "Much of the ACA’s tax effect resembles unemployment insurance: both encourage layoffs and discourage people from returning to work. The ACA’s overall impact on employment, however, will arguably be larger than that of any single piece of legislation since World War II. The ACA’s employment taxes create strong incentives to work less. The health subsidies’ structure will put millions in a position in which working part time (29 hours or fewer, as defined by the ACA) will yield more disposable income than working their normal full-time schedule. The reduction in weekly employment due to these ACA disincentives is estimated to be about 3 percent, or about 4 million fewer full-time-equivalent workers. This is the aggregate result of the law’s employment disincentives, and is nearly double the impact most recently estimated by the Congressional Budget Office. Nearly half of American workers will be affected by at least one of the ACA’s employment taxes—and this does not account for the indirect effect on others as the labor market adjusts. The ACA will push more women than men into part-time work. Because a greater percentage of women work just above 30 hours per week, it is women who will be more likely to drop to part-time work as defined by the ACA." "The Affordable Care Act (ACA) imposes several types of incentives that will affect work schedules. The largest of them are (1) an explicit penalty on employers who do not offer coverage to their full-time employees; (2) an implicit tax on full-time employment, stemming from the fact that full-time employees at employers that offer affordable coverage are ineligible to receive subsidies on the law’s new health insurance exchanges; and (3) an implicit tax on earnings, stemming from the provisions of the law that give lower subsidies to those with higher incomes." According to the liberal Center for Budget and Policy Priorities, an October 12, 2016 update shows "private employers have added 15.3 million jobs to their payrolls in the 79 months since February 2010, an average of 194,000 jobs a month." Consequently, news the economy could be hit with a reduction of 4 million fewer full-time equivalent workers certainly has to be viewed as a dark cloud hanging over the U.S. economy. News the economy is expected to grow at less than a 2% rate in 2016 only darkens the storm clouds hanging over the economy. A week ago on Sunday, October 2, 2016, we growled about Fairfax County's proposed meals tax, taking the opportunity to remind taxpayers of how the Arlington Count Board managed to levy a meals tax without a referendum. We took note of the fact the Fairfax County Board of Supervisors voted on June 7, 2016 to place a meals tax referendum on the November 8, 2016 election ballot in order for the county's voters to decide whether the county can levy the meals tax. In the Growls, we reiterated that Arlington County voters were cheated out of the opportunity of voting on whether Arlington County should levy the meals tax because of some smoke-filled, backroom shenanigans in the Virginia General Assembly in the early 1990's. To levy a meals tax, county governments were required to obtain voter approval before implementing the tax. However, an amendment put forth by an Arlington senator voided the need for the referendum if there was a unanimous vote of the county's legislators. As a result, the Arlington County Board levied an essentially unauthorized meals tax. 410 - also supports equal authority among all counties to levy and collect a tobacco tax. When we last checked in February 2006, the Virginia Association of Counties cost Arlington County taxpayers about $34,000 annually for the so-called lobbying services VACo provides. County dues are based upon population. Obviously, VACo staff didn't insert that language in the Preliminary 2016 Legislative Program without direction from some county's elected officials. However, voters throughout Virginia need to urge their county legislators to direct VACo staff to remove lines 406-410 from the final legislative package. "Without paying much attention to it, we’ve become one of the most immobile societies in the First World, and that’s a complete betrayal of the promise of America, the idea that America was uniquely the country where people could get ahead, where our kids could have a better life than we did. That still happens, of course. But less than in the past. And less than in most other First World countries. The country of opportunity isn’t America. It’s Denmark. Or Canada. It’s called the American Dream, said George Carlin, because you have to be asleep to believe it. "Obama had identified the problem, but he didn’t offer a way back. The Republicans didn’t even see the problem. Some conservative thinkers told us that it really was too bad but we couldn’t do anything about it. It happened because we had moved to a high tech world that rewarded intelligent people (like themselves) and took jobs away from everyone else. Nonsense! That doesn’t explain why other countries are more mobile. Denmark isn’t exactly in the Stone Age. "Other conservatives tell us that only envious people care about wealth differences. The people who say this tend to be pretty well off themselves, so I take this with a grain of salt. And it’s part of everyone’s DNA to care about how we rank as against other people. But the real point is that what we mostly care about is not how we rank but how our kids will rank. There’s nothing wrong with caring about that, and a lot wrong when we don’t. "Democrats tell a different story. Inequality is caused by stingy welfare benefits and low tax rates. Horsefeathers! When it comes to welfare we’re amongst the most generous countries in the world, and our taxes aren’t too low when Canada looks like a tax haven." Source: his May 17, 2016 column, "How did Trump Happen," posted at The American Spectator. The Tax Foundation released their 2016 International Tax Competitiveness Index (ITCI) last week, and the United States continues to rank near the bottom of the 35 member countries of the Organization for Economic Co-operation and Development (OECD), founded in 1961. The OECD's mission "is to promote policies that will improve the economic and social well-being of people around the world." "The structure of a country’s tax code is an important determinant of its economic performance. A well-structured tax code is easy for taxpayers to comply with and can promote economic development, while raising sufficient revenue for a government’s priorities. In contrast, poorly structured tax systems can be costly, distort economic decision making, and harm domestic economies. "Many countries have recognized this and have reformed their tax codes. 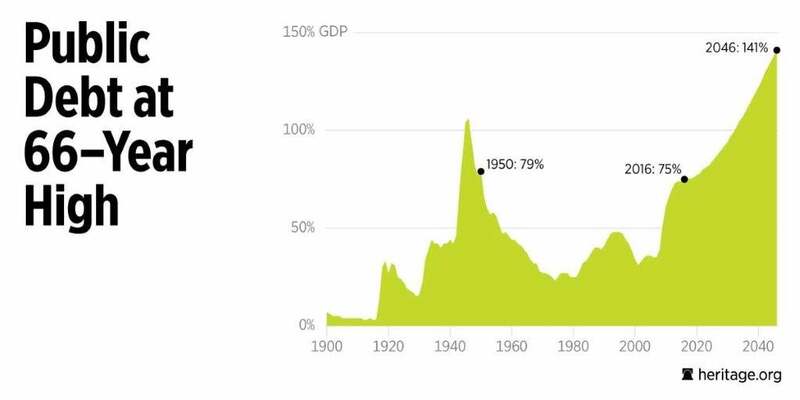 Over the past few decades, marginal tax rates on corporate and individual income have declined significantly across the Organisation for Economic Co-operation and Development (OECD). Now, most nations raise a significant amount of revenue from broad-based taxes such as payroll taxes and value-added taxes (VAT). "New Zealand is a good example of a country that has reformed its tax system. In a 2010 presentation, the chief economist of the New Zealand treasury stated, “Global trends in corporate and personal taxes are making New Zealand’s system less internationally competitive.” In response to these global trends, New Zealand cut its top marginal individual income tax rate from 38 percent to 33 percent, shifted to a greater reliance on the goods and services tax, and cut its corporate tax rate to 28 percent from 30 percent. New Zealand added these changes to a tax system that already had multiple competitive features, including no inheritance tax, no general capital gains tax, and no payroll taxes. "Some nations, however, have not kept up with the global trend. The United States, for example, has not reduced its federal corporate income tax rate from 35 percent since the early 1990s. 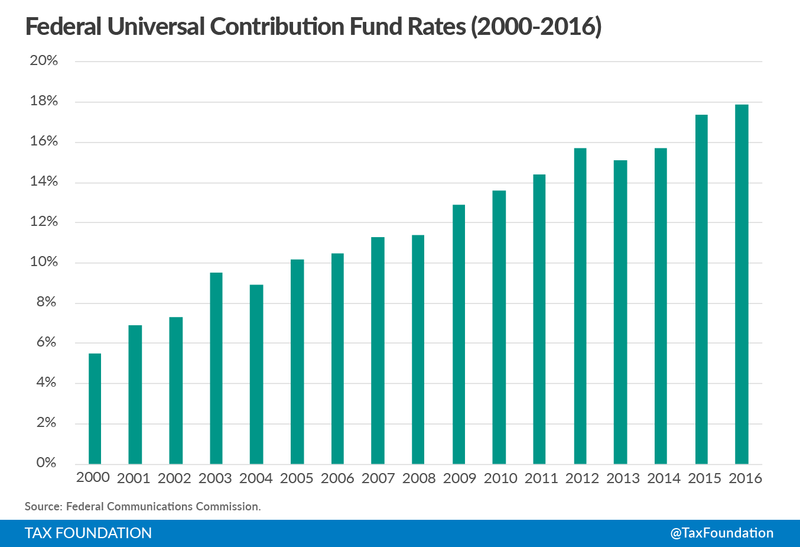 As a result, its combined federal, state, and local corporate tax rate of 39 percent is significantly higher than the average rate of 25 percent among OECD nations. In addition, as most OECD nations have moved to a territorial tax system, the United States has continued to tax the worldwide profits of its domestic corporations. "Other nations have moved further from well-structured tax policy. Over the last few decades, France has introduced a number of reforms that have significantly increased marginal tax rates on work, saving, and investment. For example, France recently instituted a corporate income surtax that pushed its corporate income tax rate from 33.3 percent to as high as 38 percent. In addition, it has other distortive taxes such as the financial transactions tax, a net wealth tax, and an inheritance tax." Table 1 of the study ranks the 35 countries with Estonia ranked #1 (overall score of 100.0). The United States is ranked #31 (overall score of 53.7). Countries ranked below the United States are Greece (52.7), Portugal (50.9), Italy (46.1), and France (43.2). The component parts of the United States' overall score included: corporate tax (#35); consumption tax (#4); property taxes (#30); individual taxes (#25); and international tax rules (#34). "The International Tax Competitiveness Index (ITCI) seeks to measure the extent to which a country’s tax system adheres to two important aspects of tax policy: competitiveness and neutrality. "A competitive tax code is one that keeps marginal tax rates low. In today’s globalized world, capital is highly mobile. Businesses can choose to invest in any number of countries throughout the world in order to find the highest rate of return. This means that businesses will look for countries with lower tax rates on investment in order to maximize their after-tax rate of return. If a country’s tax rate is too high, it will drive investment elsewhere, leading to slower economic growth. In addition, high marginal tax rates can drive tax avoidance. "A neutral tax code is simply one that seeks to raise the most revenue with the fewest economic distortions. This means that it doesn’t favor consumption over saving, as happens with investment taxes and wealth taxes. This also means few or no targeted tax breaks for specific activities carried out by businesses or individuals. "A tax code that is competitive and neutral promotes sustainable economic growth and investment while raising sufficient revenue for government priorities. "There are many factors unrelated to taxes which affect a country’s economic performance. Nevertheless, taxes play an important role in the health of a country’s economy." The United States ranked #31 (score 54.6) in 2014; #32 (score 54.6) in 2015; and #31 (53.7) in 2016. A 5-page version of the report is here. The entire 47-page report is here. "The Tax Foundation is the nation’s leading independent tax policy research organization. Since 1937," their "principled research, insightful analysis, and engaged experts have informed smarter tax policy at the federal, state, and local levels." "President Obama has swelled the ranks of government PR, adding hundreds of new public relations specialists to the federal payroll during his time in office, costing taxpayers a half-billion dollars a year, the government’s chief watchdog said Wednesday. "That doesn’t include the more than $100 million the administration spends annually for help from private sector spinmeisters, nor does it account for the $800 million spent on contracts for advertising in 2015, according to the Government Accountability Office. “Spending $1.5 billion on government PR activities is a huge waste of money. That sort of spending should be drastically scaled back,” said Chris Edwards, a federal budget scholar at the Cato Institute. "The administration added some 667 PR staffers between 2008, the last full year under his predecessor, and 2011, when public relations staffing across federal agencies peaked at 5,238 people. That’s a jump of 15 percent during those years." "GAO investigators said in their report that agencies “may have legitimate interests in communicating with the public regarding their functions, policies and activities.” The report said the National Zoo’s webcams, the Centers for Disease Control and Prevention’s warnings about the Zika virus and the IRS’ advertising of tax credits available to taxpayers are all examples of PR activities. "But Mr. Edwards, the Cato budget scholar, said the government is also paying for “one-sided propaganda,” including touting of federal programs that are failing. At the Heritage Foundation's Daily Signal on Thursday, Melissa Quinn also reported on the I.S. General Accountability Office (GAO) report"
"Over the past decade, federal agencies have spent money that qualifies as public relations and advertising spending on things such as webcams at the Smithsonian’s National Zoo that allow visitors to its website to see specific animals, campaigns from the Department of Transportation against distracted driving, and publicized information from the Centers for Disease Control and Prevention on the Zika virus, the GAO found. "Government spending topped $3.4 trillion, before interest payments, last year. Spending on advertising and public relations activities, Goldwein said, account for just 0.03 percent of total spending. "Still, Goldwein said “every dollar is important,” but stressed that it is important to understand how the money is being spent. "Raising awareness of a federal program, for example, can be a good thing. “If these dollars are being wasted, it’s important to address that, even if it’s just a small drop in the pool,” he told The Daily Signal." The summary for the GAO report can be accessed here where you can also access the entire 21-page report. The following chart of federal obligations on contracts for advertising and public relations is from the GAO report's "fast facts." Source: page 223, "As Certain as Death: Quotations about Taxes," 2010, compiled by Jeffrey Yablon, TaxAnalysts.com. "Billings Learned Hand (January 27, 1872 – August 18, 1961) was a United States judge and judicial philosopher. He served on the United States District Court for the Southern District of New York and later the United States Court of Appeals for the Second Circuit. Hand has been quoted more often by legal scholars and by the Supreme Court of the United States than any other lower-court judge, according to Wikipedia. Growls used this Learned Hand quotation on September 19, 2008, but given the New York Times' publication of a portion of GOP presidential nominee Donald Trump's 1995 income tax returns, and the nearly week-long pandemonium that followed, your humble scribe is repeating the quotation. The Cato Institute released their 13th biennial fiscal report card on America's governors yesterday. In the new “Fiscal Policy Report Card on America’s Governors,” Cato scholar Chris Edwards examines the tax and spending decisions made by U.S. governors since 2014. "State governments have been in an expansionary phase in recent years. Even though U.S. economic growth since the last recession has been sluggish, general fund revenues of state governments have grown 33 percent since 2010. Some of the nation’s governors have used the growing revenues to expand spending programs, while others have pursued tax cuts and tax reforms. "That is the backdrop to this year’s 13th biennial fiscal report card on the governors, which examines state budget actions since 2014. It uses statistical data to grade the governors on their taxing and spending records—governors who have cut taxes and spending the most receive the highest grades, while those who have increased taxes and spending the most receive the lowest grades. "Five governors were awarded an “A” on this report: Paul LePage of Maine, Pat McCrory of North Carolina, Rick Scott of Florida, Doug Ducey of Arizona, and Mike Pence of Indiana. Ten governors were awarded an “F”: Robert Bentley of Alabama, Peter Shumlin of Vermont, Jerry Brown of California, David Ige of Hawaii, Dan Malloy of Connecticut, Dennis Daugaard of South Dakota, Brian Sandoval of Nevada, Kate Brown of Oregon, Jay Inslee of Washington, and Tom Wolf of Pennsylvania. "With the growing revenues of recent years, most states have balanced their short-term budgets without major problems, but many states face large challenges ahead. Medicaid costs are rising, and federal aid for this huge health program will likely be reduced in coming years. At the same time, many states have high levels of unfunded liabilities in their pension and retiree health plans. Those factors will create pressure for states to raise taxes. Yet global economic competition demands that states improve their investment climates by cutting tax rates, particularly on businesses, entrepreneurs, and skilled workers. "This report discusses fiscal policy trends and examines the tax and spending actions of each governor in detail. The hope is that the report encourages more state policymakers to follow the fiscal approaches of the top-scoring governors." "A possible recession is not the only storm cloud for state budgets. The states face rising health-care costs, and many states have large unfunded liabilities in their retirement plans. Liberals might think that these problems can be solved by more tax increases, but in today’s competitive economy businesses and skilled workers are footloose, so tax hikes will shrink the tax base and reduce economic growth. "We need more pro-business and pro-taxpayer environments in every state, and Cato’s “A” governors are leading the way on reforms." With an overall score of 49, Virginia Governor Terry McAuliffe earned a grade of D (Table 1, page 4). Virginia's per capita debt was $7,919 (New York was highest at $17,584 and Wyoming was lowest at $3,420). Virginia's pension liability was $2,902 per capita (New Jersey was highest at $12,656 and South Dakota was lowest at $778). Virginia's average per capita OPEB liabilities are $414 (Alaska's are highest at $20,699 and North Dakota's are lowest at $108). The report contains two additional tables showing 1) spending and revenue changes, and 2) tax rate changes. "Terry McAuliffe is a businessman and long-time political operative. On this report, he scored below average on spending and above average on taxes. He has supported a smattering of tax in- creases and cuts. His best proposal has been to reduce the state’s corporate income tax rate from 6.0 to 5.75 percent. The governor said that he was motivated to cut the corporate tax because of North Carolina’s reforms: “In order to build the new Virginia economy, we have to make the commonwealth competitive in the global market.”97 McAuliffe has also proposed increasing re- search tax credits and increasing personal exemptions under the income tax. Unfortunately, the tax reductions have not moved through the legislature. The governor has appeared to tie the tax cuts to his proposal for Medicaid expansion, which the Republicans do not support." E-mail Governor Terry McAuliffe here. Growls readers who are concerned that Virginia is moving in the wrong fiscal direction are also urged to provide their comments to their state legislators. The following legislators represent Arlington County in the Virginia General Assembly: Senators (Adam Ebbin, Barbara Favola, or Janet Howell) and Delegates (Rip Sullivan, Patrick Hope, Alfonso Lopez, or Mark Levine). Contact information for members of the General Assembly can be found here -- use one of the "quick links" to locate the senator and delegate who represent you. "While there is no "iron curtain" around our campuses, there is a curtain, and its effects are dangerously close to the effects produced by the "iron curtain" around the Soviet bloc. What is lacking is anything like the Voice of America broadcasts to pierce the academic curtain." Source: his 10/4/16 column, "The Academic Curtain," posted at Townhall.com. Thomas Sowell is the Rose and Milton Friedman Senior Fellow at The Hoover Institution, Stanford University. Visit his website, tsowell.com. "In fiscal 2016, which ended on Friday, the federal debt increased $1,422,827,047,452.46, according to data released today by the U.S. Treasury. 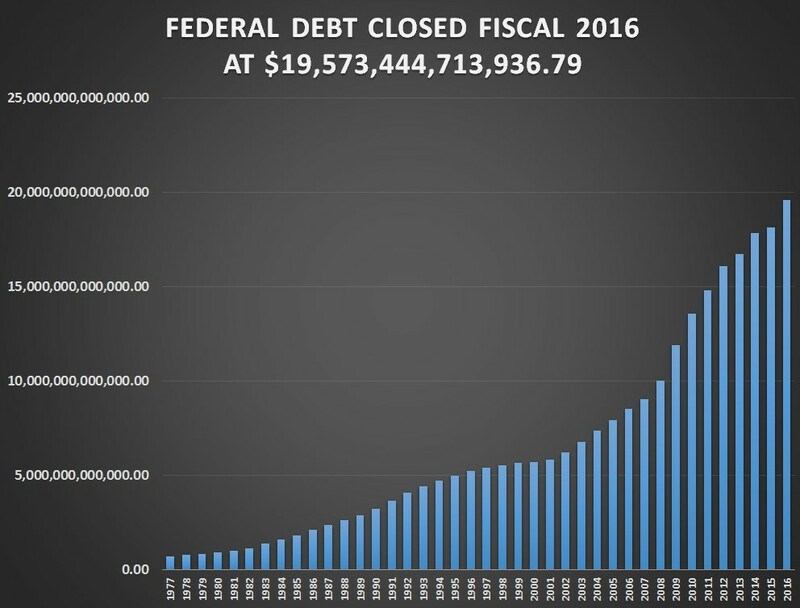 "At the close of business on Sept. 30, 2015, the last day of fiscal 2015, the federal debt was $18,150,617,666,484.33, according to the Treasury. By the close of business on Sept. 30, 2016, the last day of fiscal 2016, it had climbed to $19,573,444,713,936.79. "According to the Census Bureau’s latest estimate, there were 118,215,000 households in the United States as of June. That means that the one-year increase in the federal debt of $1,422,827,047,452.46 in fiscal 2016 equaled about $12,036 per household. Jeffrey also discussed the "debt issuance suspension period," which took up eight months of 2015. For resources on "fixing" the national debt, visit Fix the Debt, a campaign of the Committee for a Responsible Federal Budget. What does it Mean to 'Pay Your Fair Share of Taxes'? "That term, "fair share," seems to get a lot of press these days. It's always been around, but since 2011, when billionaire Warren Buffett proposed his so-called "Buffett Rule," which states that anyone earning more than $1 million should pay at least 30% of it in taxes, it has become much more popular in liberal political circles. The idea sprang from Buffett's observation that his secretary paid a higher income tax rate than him. Note the subtlety in this observation – a higher tax "rate," not higher taxes. I'm certain he paid a lot more in dollars to the IRS than his secretary did. But should he have to pay a higher tax rate? His fair share? "What is a person's fair share? The top 1% of taxpayers in the U.S. pay 44% percent of all income taxes collected, and the top 20% of earners pay a whopping 84% of all taxes. This is while 45% of adult taxpayers pay nothing at all. Yes, there's no question that some people are less fortunate than others, and some people truly need financial help – but almost half of the population? And what about that top 1%? With that very small group paying roughly half of all of the taxes, does anyone believe they use anywhere near half of all the services provided by the government? Do they get their fair share of government programs? "Yes, it's a ludicrous argument, because clearly Warren Buffett or Bill Gates does not need housing or food assistance. And yes, they should probably pay more in tax dollars than someone living on minimum wage. But how much more should they pay? Millions? Billions? Ah...they should pay their fair share. Proponents like to ignore the dollars paid and point instead to the tax rate paid as a percentage of income, so let's look at it that way. "According to the non-partisan Tax Policy Center, the top 1% of earners pay an average tax rate of 23% of their income. This is clearly below the Buffett Rule, since this group averages an annual income of around $2.1 million per year. But that 23% is seven times the average tax rate paid by the other 99% of the population. While we can always search to find a specific millionaire and compare him to a specific minimum wage worker to "prove" the worker pays a higher tax rate, in aggregate, it simply isn't true. It's not even close!" Source: his October 3, 2016 column, "How Fair is Paying Your Fair Share? ", posted at The American Thinker. Kevin Cochrane teaches economics and business at Colorado Mesa University, and is also a permanent visiting professor of economics at The University of International Relations in Beijing. A story in the Washington Post on September 23, 2016, discussed the "intense fight to sway voters on (the) meals tax." "The issue," according to Antonio Olivo, is: "(w)hether diners in Fairfax County should pay four cents extra for every dollar spent on restaurant meals to raise money for county schools, parks and other services." "County officials estimate that a 4 percent meals tax would generate $96 million in extra tax revenue per year, which supporters say would help avoid large property taxes increases while keeping up with the demands of an aging infrastructure and a growing school system of 186,000 students. "Opponents say that the new tax — which would also apply to food purchased at convenience stores — would drive business away from this wealthy suburb, impose a new burden on financially stretched consumers and cost some restaurant workers their jobs. "Both sides have launched campaigns to win over county voters that rely on public relations strategists, grass-roots messaging and political spin. "For the local unions, school board members and PTA groups who support the meals tax, that has meant including students among the ranks of volunteers knocking on voters’ doors to talk about crowded classrooms and teachers leaving for higher-paying districts. The measure’s advocates also have organized “Dine Out” trips to restaurants whose owners support the proposed tax. "Meanwhile, the restaurant groups and chambers of commerce who oppose the measure call themselves “Fairfax Families Against the Meals Tax,” in an attempt to portray the issue as one that could hurt working-class families and blue-collar employees. "Inside restaurants, owners have posted large signs that characterize the measure as a “10 percent Food Tax” — counting both the existing 6 percent state and local sales tax and the proposed levy of 4 percent. "Yes! Another chance to talk about how Arlington's political elite slipped a tax noose around the neck of Arlington taxpayers. Next Tuesday, voters in Hanover County will vote on a 4% meals tax, according to today's Richmond Times-Dispatch. As we wrote a few days ago, Arlington County voters were prevented from voting by legislative maneuvering (a floor amendment allowing Arlington's County Board to avoid a referendum if the Board voted unanimously for the tax) in the General Assembly. Never the less, Henrico County's bureaucrats use the same, sorry logic to justify the tax. For example, they say that $1 million of the $2.5 million expected to be generated by the tax "would be paid by commuters and visitors to Hanover." Gee, that sounds like what Arlington poobahs tell us when we complain about the meals tax." For more on the meals tax in Virginia, see our November 5, 2015 Growls after voters in Appomattox County rejected a meals tax. The post is especially helpful because it contains several embedded links. UPDATE (10/4/16): The Arlington Sun Gazette's Brian Trompeter reported yesterday on a panel debate on the proposed Fairfax County meals tax, noting, "Connection Newspapers editor and publisher Mary Kimm moderated the debate, which was sponsored by the League of Women Voters of the Fairfax Area and held at Luther Jackson Middle School. It drew about 100 people." "The program designated a target amount for reinsurance payments as well as a specified amount that must go in the general fund of the United States Treasury under section 1341 of the law. In 2014, the law targeted collections of $10 billion for reinsurance payments and $2 billion for the Treasury. "Members of Congress asked the Government Accountability Office to review the agency’s actions to see whether it has the authority to prioritize payments to failing issuers over payments to the Treasury if the collections do not hit the specified amount." "How bad is ObamaCare? Six years after its passage, it may cost Democrats the Senate. Nearly every bit of news about the law is bad — skyrocketing premiums, co-ops closing, insurers abandoning the exchanges, millions paying the penalty rather than buying coverage. And now the latest. A program called “transitional insurance” collected fees from private insurance plans to redistribute to insurance companies to cover for more expensive enrollees. (It’s similar to but separate from “risk corridors.”) But because ObamaCare has pretty well blown through all cost estimates, the amount collected wasn’t enough. Naturally, the way Barack Obama’s administration handled that runs afoul of the law, because the Department of Health and Human Services did not allocate the required funds to the U.S. Treasury (i.e. taxpayers) before bailing out insurers. In fact, rather than make any payments to the Treasury, it sat on some extra money. "According to a new GAO report, “When total collections for benefit year 2014 — $9.7 billion — fell short of the target amount for reinsurance payments, HHS did not allocate any collections to the Treasury or to administrative expenses. Because the agency collected less than the $10 billion target for reinsurance payments, it allocated all of its collections for those payments. The agency received $7.9 billion in reinsurance claims and paid these in full, leaving approximately $1.7 billion in collections, which it carried over for reinsurance payments in subsequent benefit years. As a result, HHS did not deposit any amounts collected from issuers into the Treasury.” GAO says HHS doesn’t have that authority. All told, Obama took $3 billion in taxpayer money and gave it to private insurers instead — all because ObamaCare is such a destructive law." "The Department of Health and Human Services (HHS) administers the 3-year transitional reinsurance program established under section 1341 of the Patient Protection and Affordable Care Act. The program, which is financed by statutorily required contributions from participating health insurance issuers and group health plans, makes payments to eligible issuers, to stabilize health insurance premiums and encourage issuer participation in the health insurance markets. Section 1341 designates a specified amount of collections from issuers for reinsurance payments and also directs the deposit of a specified amount of collections in the general fund of the United States Treasury (Treasury). HHS asserts that when collections fall short of the amounts specified in statute the agency has authority to allocate all collections for reinsurance payments, making deposits in the Treasury only if collections reach the amounts specified for reinsurance payments in section 1341. HHS lacks authority to ignore the statute's directive to deposit amounts from collections under the transitional reinsurance program in the Treasury and is required to collect and deposit amounts for the Treasury, regardless of whether its collections fall short of the amounts specified in statute for reinsurance payments. HHS may not use amounts collected for the Treasury to make reinsurance payments." Yesterday's Wall Street Journal also reported on this story (page A3, WSJ). The lede in Louise Radnofsky's story reads, "The Department of Health and Human Services has been improperly favoring insurers over the Treasury in distributing funds from an Affordable Care program, a congressional watchdog told Republicans on Thursday." She added, "The 2010 health law required federal health officials to collect fees from unions, employers and insurance companies for a program called "reinsurance," to reimburse health plans that sustained a heavier burden of medical claims during the first few years of the law's life." "The U.S. Government Accountability Office has agreed with House Republicans in a dispute that could cost issuers of individual health coverage about $2 billion. "The GAO, a congressional watchdog agency, says the U.S. Department of Health and Human Services must pay billions of Affordable Care Act reinsurance program revenue to the Treasury first before making reinsurance program payments to health insurers, according to a new GAO legal ruling." "We keep reading that Donald Trump poses a unique threat to constitutional norms if he’s elected. His liberal critics would have more credibility if they called out the Obama Administration for its current (not potential) abuses of power, and here’s an opportunity: The Administration is crafting an illegal bailout to prop up the President’s health-care law. "News leaked this week that the Obama Administration is moving to pay health insurers billions of dollars through an obscure Treasury Department account known as the Judgment Fund. This would be a cash infusion for an ObamaCare program known as “risk corridors,” an allegedly temporary provision in the 2010 law that enticed insurers to participate in the exchanges." "This is an illegal move to spend money where Congress wouldn’t. A June memo from the Congressional Research Service notes that plaintiffs would have to wait until the government digs up more money or Congress decides to appropriate it. In a 1998 letter the Government Accountability Office pointed out that the Judgment Fund is not a tool to “circumvent congressional restrictions on appropriations,” which is precisely what the White House is doing." At the Hot Air blog on Friday, September 30, 2016, John Sexteon points out, "A Washington Post story published Thursday confirms most of what has been rumored about a plan by the Obama administration to do an end-run around congress and bailout Obamacare insurers . . . ."
"The Obama administration appears to be gearing up for an end run around congress. Though it hasn’t happened yet, there are signs the administration is planning to settle lawsuits over the so-called risk corridors program, thereby paying insurers in the form of settlements money that Congress has said the administration cannot pay out directly. "When Obamacare was created there were three programs designed to help stabilize the market. One of those three programs, called risk corridors, was a kind of financial balancing act among insurers. Those who earned more than anticipated would pay into a pool and those who earned less than anticipated would file claims on the money in the pool. "What happened is that most insurers lost money in 2014 meaning there was very little money put into the risk corridors pool and a lot of insurers wanting to take money out. At this point the Obama administration would have simply paid out the extra $2.5 billion insurers requested but congress stepped in to insure the risk corridors program would stay budget neutral. From Forbes . . . ."
Here's the September 29, 2016 Washington Post article, reported by Amy Goldstein, that Sexton cited above in his September 30 post. "In his latest assault on the separation of powers, President Obama seems poised to take unilateral executive action—in direct defiance of legislation he signed—to bail out insurance companies under Obamacare. In its above-the-fold story on Friday, the Washington Post mischaracterizes Obama's power grab in two important ways: First, it claims that the bailout money is merely what "the government owes" insurers and "what the insurers are owed." Second, it claims that the program in question "originally was not supposed to pay for itself," until Republicans altered it. Each of these claims is false. "Obamacare's "risk corridor" program was designed to redistribute money in the Obamacare exchanges from health insurers who made money to those who lost money. Profitable insurers would pay in; unprofitable insurers would get paid out. With so many insurers losing money under Obamacare, however, the program was positioned to become a bailout, as there was no guarantee in Obamacare's text that the money paid out wouldn't exceed the money paid in. "Marco Rubio sounded the alarm in a Wall Street Journal op-ed in November of 2013. He highlighted that the risk-corridor program was poised to become a taxpayer-funded bailout of insurers when it went into effect the following year, and he introduced legislation to prevent this result. A little over two months later, however, the Congressional Budget Office projected . . . ."